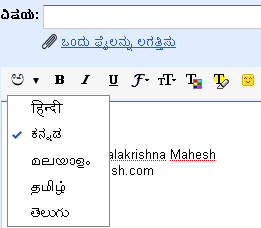 Gmail now supports the 5 Indian languages – Hindi, Tamil, Telugu, Kannada and Malayalam. Users have been complaining about the lack of language support on popular email platforms (Gmail, Yahoo, Hotmail). To activate Indian language (Indic) you need choose the language on your Settings page. You can set the ‘display language’ (labels) and transliteration language (for composing of mails) in your Settings page. Users should note that Gmail supports transliteration (you type in English and it shows the equivalent word in the language of your choice). I have come across users who would like to see language keyboards being supported. Anyways, for now this is a good beginning. So far gmail users could ‘read’ the text of the mail if it was in the language but the labels and composition were always in English. According to JuxtConsult majority of internet users in India are interested in languages. They are sure to welcome this new feature from Google.